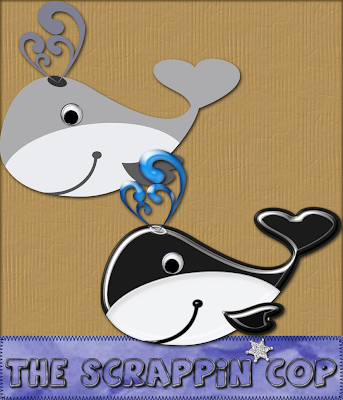 The Scrappin Cop: CU Whale Layered Template!! I'm winding down on the Ocean Pals templates. I think I have a shark to do yet, maybe a stingray and sea turtle. Today's template is a little whale. I also have been playing with a brush set and should have that up tonight too if I get the TOU, preview, etc. done in time. I am trying a new hosting service too, called File Savr. Choose which link to download from and let me know via comment here on my blog if you like it (if you try it). If it is faster, slower, etc. There is not an option to leave comments on FileSavr so I don't know if I am going to stick with it but I thought I would try it out. Let me know! Thanks! Thanks so much for all of your adorable sea friends, thay are all so wonderful. I always look forward to what you will design next. Thanks for sharing your time & talents with so many.Thanks again for the GREAT dolphin,I just LOVE him! Thanks so much for sharing hun! Thank you! Your blog post will be advertised on the DigiFree Digital Scrapbooking Freebie search engine today (look for timestamp: 17 Sep [LA 12:00am, NY 02:00am, UK 07:00am, OZ 05:00pm] ). The whale is so cute. I'm loving all your sealife. I also love FileSavr. There's no waiting and I've been having so many issues with 4Shared lately. I do wish there was a place to leave comments though. Thanks so much for all you do. All of your sea and ocean creatures are just amazing. Thanks so much.